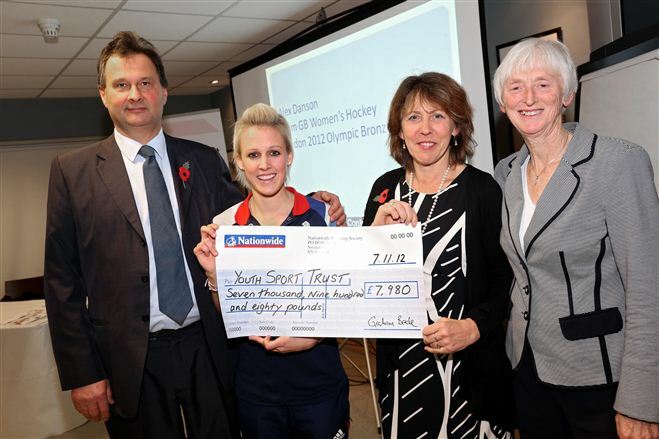 A cheque for nearly £8000 was presented to the Youth SportsTrust on November 7th at Newbury Racecourse, during the closing dinner of the first of this year's Raising Achievement conferences. This was funds raised from Harry’s Lunch and Pirate Day. Please visit the Youth Sports Trust web site for more details. Wendi Parcell whose daughter Livvie was best friends with harry was the inspiration for Harry’s lunch and in partnership with Judi raised this sum of money. Unfortunately Wendi at the last minute was unable to make the presentation – needless to say many thanks to Wendi for her dedication to Harry’s Lunch. Pictured below is Wendi with husband Graham whose business The James Consultancy sponsored the Lunch. The Youth Sports Trust present the Harry Mills Team Maker Award each year and will be doing so in January 2013 where Richard and Judi will present the award. For more information please click here.